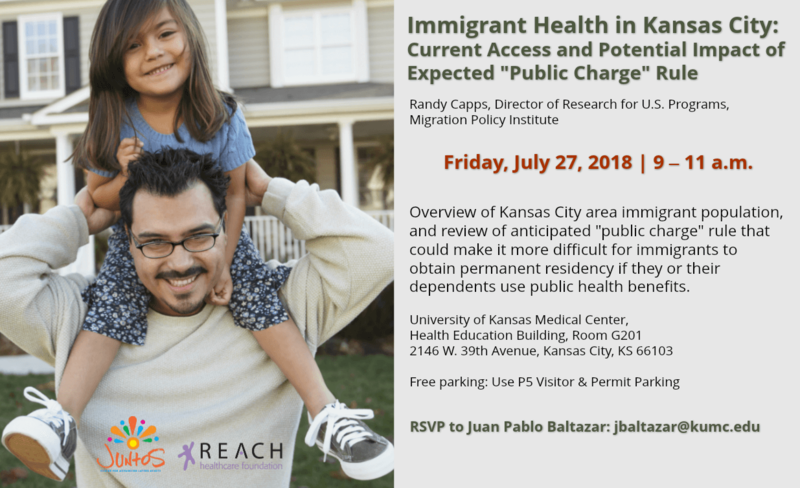 On Friday, July 27, 2018, 9-11 a.m., JUNTOS, The Center for Advancing Latino Health at KU Medical Center, with support from the REACH Healthcare Foundation, will host an event offering a look at Immigrant Health in Kansas City, along with a discussion on the possible impact of an anticipated change in the “public charge” rule that could make it more difficult for immigrants to obtain permanent residency if they or their dependents use public health benefits. Randy Capps, Director of Research for U.S. Programs at the Migration Policy Institute, will provide data on immigrants in our metropolitan area and outline the “public charge” rule and how it might affect immigrant families in our region. Capps is a leading national expert on the demography of the U.S. immigrant population, with a focus on health and social service needs of immigrant families with children. He has written numerous reports on immigrant populations at the state and local levels, including regarding Arkansas, California, Connecticut and Maryland, as well as studies of immigrant populations in Kansas City, Houston, Louisville and Washington, D.C. The Migration Policy Institute recently released a report on the anticipated “public charge” rule and its expected impact on immigrants and their families. Find the link to the report. To RSVP for the July 27, 208, event, email Juan Pablo Baltazar, University of Kansas Medical Center, at jbaltazar@kumc.edu.